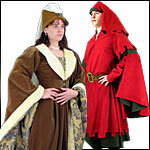 In this category you will find lots of medieval and renaissance doublets, vests, jerkins, medieval tunics, roman tunics, hosen, codpieces and knight's surcoats. Our jerkins and tunics styles achieve the look or character you are going for, whether it be Peasant, Knight or Noble. Whether you prefer Breeches, full length pants or a Kilt, you will find it here at By The Sword. Our medieval style pants, breeches, fencing pants and Scottish Kilts go great with all of our shirts and period footwear. We have Scottish kilts made in quality leather like the Gladiator skirt to give you that roman solider look.